Preheat oven to 450°F. Slice the pumpkin in half using a sharp knife. Scoop out the flesh and seeds. Peel off the skin and cut the flesh into bite sized chunks. Toss the pumpkin chunks with olive oil and season with chili powder, salt and pepper, then roast on a baking sheet until tender, about 30 minutes. Meanwhile, whisk together the dressing ingredients (maple syrup, red wine vinegar, olive oil, salt and pepper in a small bowl). 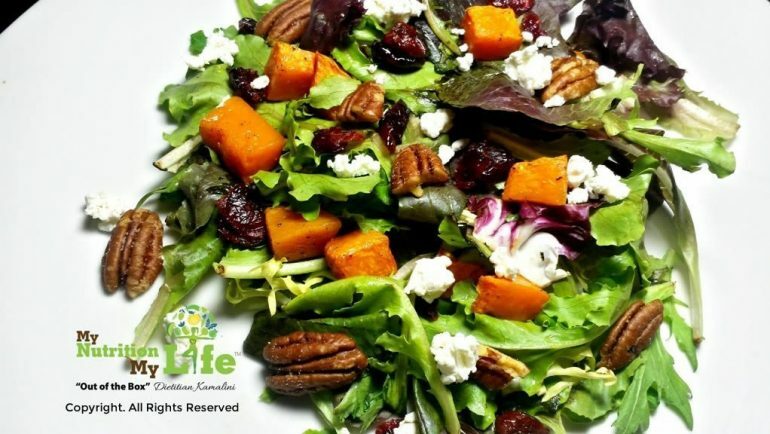 Assemble the salad by mixing together mixed greens, roasted pumpkin, pepitas, cranberries, and goat cheese or feta cheese, pecan or walnut halves . Toss with desired amount of dressing. Enjoy!